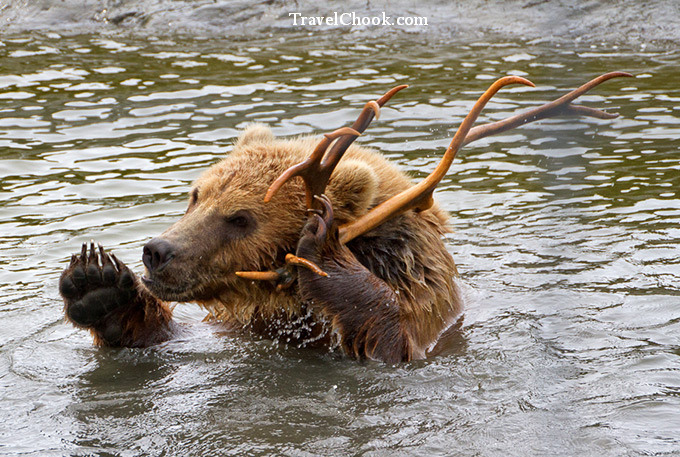 Watching a grizzly cub galloping toward a large pond and diving in was cute enough, but then staring spellbound as he emerged from the pond with antlers, was something else! 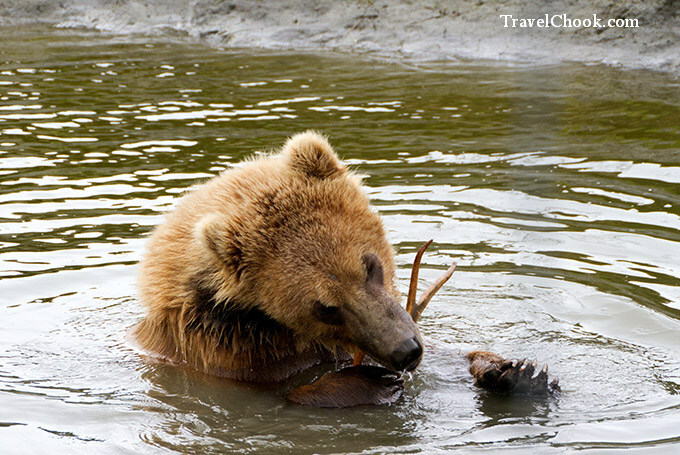 Alaska was full of surprises, but this adorable grizzly bear cub playing with antlers was certainly something I can never forget. There was no-one else around at that time. It appears a bit of initial drizzle had scared away patrons from the Alaska Wildlife Conservation Centre. But the grizzly bear cub, seemed oblivious to everything but having a great time and putting on a huge and impressive show. His beautiful Kodiak bear pads didn’t even look real, they were so perfect. 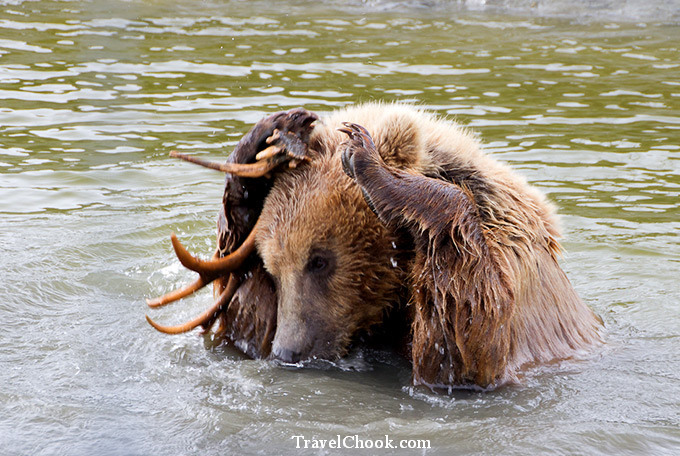 Biting and pawing the antlers, the bear couldn’t get enough of them. He did everything possible with these antlers, including fitting them around his nose – note his paw print in the background. He also carried the antlers around in his mouth like a dog would a bone. At this point, it was tempting to jump in and throw my arms around him – so adorable. But of course, he is still a real bear after all, not the type you buy for $20 and leave on your bed at night – so I refrained. Everything the bear did was incredibly funny to watch, but there was one thing that really struck me as particularly interesting. This was when he tried to put the antlers on his head. It was as though he had seen an antelope or caribou and knew exactly where the antlers should go. The whole scene was just mesmerising. The pure playful energy radiating from this absolutely adorable Kodiak bear was infectious. He was brimming with curiousity, taking a keen interest in everything that was going on. 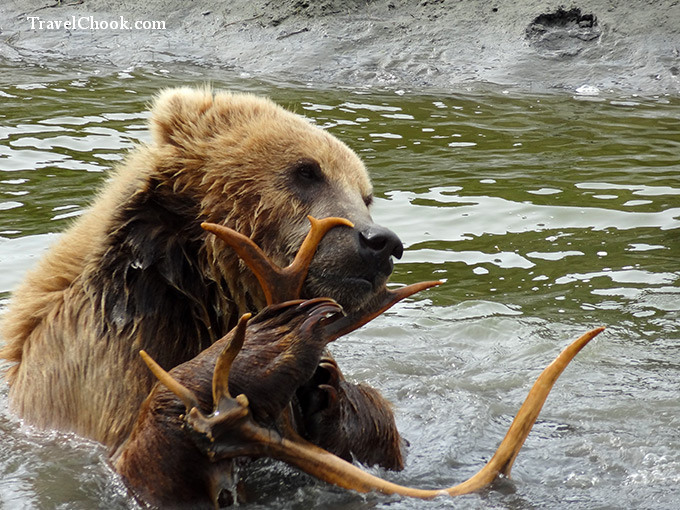 There was something extra special about this intelligent and pretty Kodiak cub. 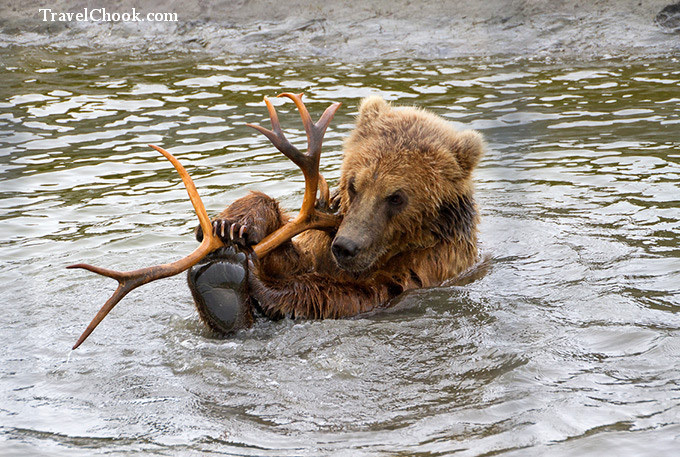 We found out later that day that the staff at the Alaska Wildlife Conservation Centre had no idea there were antlers in the bottom of the pond and it was the first time they’d been seen by anyone. 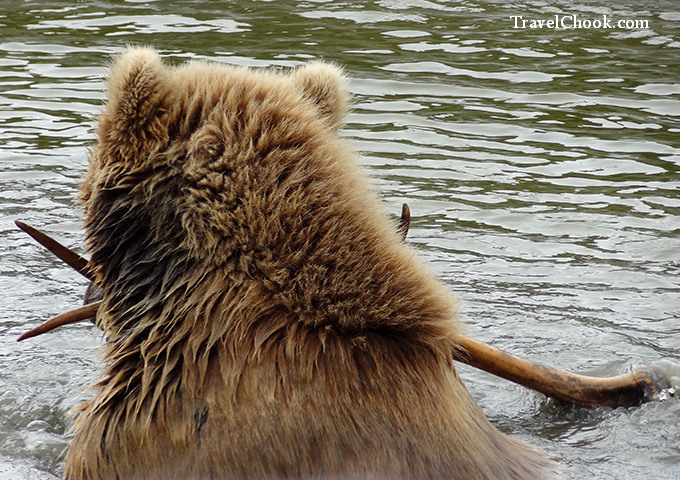 I came to Alaska for many reasons, including to see bears in the wild – and I saw plenty. But the stop off at the centre unexpectedly provided a close up (literally a metre away) of this gorgeous bear cub that will always be special. There was another young bear here as well, but this one stood out because he had such a vibrant huge personality. You meet some people who are obviously making the most of their life and living it to the extreme. This bear cub seemed a bit like that, like he wanted to tear the very thrills of existence from life. It was something that just oozed from him. He looked very happy and as though if there were any mischief to be had, he would be all in.